The theory behind the BARF diet or Biologically Appropriate Raw Food is that your pet should be fed on raw meat and bones as their wild ancestors (wolves) would have done. These diets tend to contain the feeding of raw chicken wings, necks or carcasses with bones. In addition the weekly feeding of fish is also recommended. Raw diet proponents point to the wolf as a comparison. Some, if not all, BARF users, profess only the feeding of meat as dogs are considered to be carnivores. The reasons dogs were given such strong teeth and jaws is for killing and tearing apart their prey and their stomachs are capable of digesting raw meaty bones. Excluded from the barf diet are any cereals as they believe that these products are directly responsible for many of the health problems we see today with our pets. Carbohydrates are not required by dogs. For your pet to be healthy and remain healthy to an old age, the diet must be nutritionally balanced. 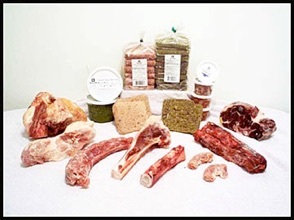 It is advocated that bones contain all of the minerals your pet required in the perfect balance. Vitamins are required for the correct bodily functions. 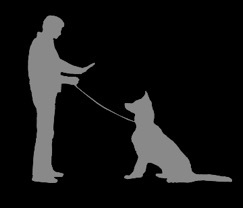 Raw Meat contains all the necessary vitamins for a healthy dog. All living organisms contain enzymes; however, cooked or processed foods do not have these enzymes. 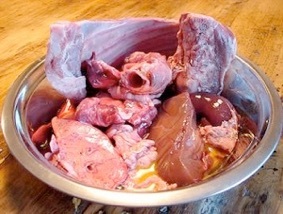 Raw meat contains all of the enzymes required for the health and vitality of your dog. "The domestic dog and the wolf are separated by about 14000 years, and cannot truly be compared. The wolf is actually an omnivore, feeding on vegetation and berries, not only meat”. mean that all wolves are fit and healthy and do not die from perforated bowels. 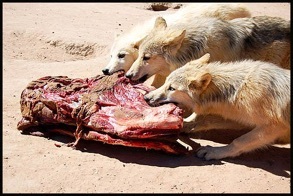 Wolves as stated above are not true carnivores, but omnivores. They also have the ability, when meat is scarce to digest vegetables. 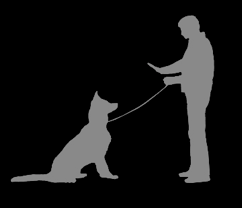 Captive wolves are generally fed from animals killed on the road. However, they do not generally eat the meat until it has been buried to let it purify. This process allows for some of the complex proteins to be broken down, which is beneficial to wolves as well as our pets. At this stage it should be noted that in order for an animal to receive the required calories and nutrients as a provided in a commercially manufactured food, you would have to feed them five times more meat than in the manufactured food. Many hundreds of years ago dogs were scavengers and predators. Over time canines and felines were used in the household, for example rodent control especially in the grain stores. The animals were rewarded by the humans for the task they had completed. Over time dogs and cats became dependant upon humans to provide food and shelter. Even just before World War II, commercially produced pet foods were not available. Even if they were available, we would not have had the money to purchase them. Due to the damage caused during the war, they were hundreds of homes built to house the returning servicemen. In order to pay for the homes, more women went out to work. Thus the only food available to pets, were the leftovers from the tables of their owners. Of course at this time there was little knowledge available on pet nutrition and any details which were available were put onto labels in such a language that the normal every day person could not understand them. In commercially produced pet foods, during this period, the primary meat used was horse meat and it was soon discovered that many pets were allergic to the protein in horse meat and developed serious allergies. Thus pet owners decided to embark in the preparation of pet foods themselves. Especially as at that time, it was becoming obvious that the majority of commercially produced pet foods were causing considerable health problems with dogs. Hence the propagation of raw food diets. Of course we never thought about the potential for Salmonella and other fatal organisms. Although, of course, many years ago, dogs were resilient to these types of bacteria, when they lived in the wild! meat protein. We should then look at the presence of tapeworms such as Echinococcus Granulosus which is often found in the liver and lungs of animals. These can be seen in many forms and can be due to bones, choking, obstruction, perforation and impaction where bony material accumulates in the large bowel. E. coli can cause serious infections. Even if a case is made that dogs can tolerate bacteria-rich food there are equally important concerns for the owners and their family. Unless scrupulous hygiene measures are maintained for the storage and preparation of these raw meats there are real risks of infection. Owners who formulate their own BARF diet may fail to provide a balanced diet for their dog giving rise to significant health problems. Despite the fact the purists would argue a properly prepared BARF diet will be balanced, many BARF feeders do supplement the diet with either dog food or add a mineral and vitamin supplement. It has been shown in recent research that veterinarians have seen an increase in illnesses associated with; the brain, heart, liver, kidney and pancreas. Many dogs that will die from these diseases do not show any symptoms until days prior to the death. Like humans, pets are living longer by eating wholesome and well balanced diets which contain the correct balance of vitamins and minerals, Are we saying that the raw diet is best; does this also mean that humans should feed raw food as it contains the optimum level of digestive enzymes? Why do we risk our pets and own health by feeding raw food? There are those who suggest that by blanching meat for a few seconds will render it safe. Although it can be said that this does kill some bacteria, there are other bacteria that will survive. If you look at some of the information available with regard to the BARF diet, it promotes that a healthy dog can survive on 60-70% raw meaty bones. Does this mean that only healthy dogs can be fed the BARF diet?